A few times I have found myself in Outlook Web Access, unable to figure out how to open a shared calendar, or the mailbox of a co-worker. 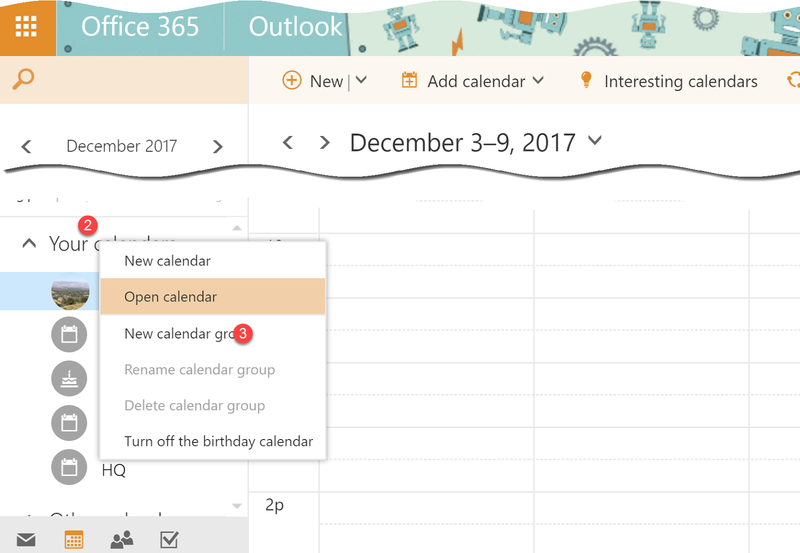 Here is a quick set of instructions on how to open a shared mailbox calendar, or any user’s calendar. Office 365 OWA really simplifies the user experience. That’s good but it is easy to miss out on certain navigation elements. When you open OWA, you have a navigation similar to the view shown below. At the bottom left corner of the navigation, click the calendar icon (1). After the calendar view appears, right click the menu Your Calendar as shown at circle (2). Start typing the name or email address of your shared mailbox at (4). Even before you finish, your desired mailbox should appear in the list. Select and click on the desired mailbox shown. An example is shown at circle (5). The dialog will display your selected mailbox (6). Click the Open button shown at circle (7). At Circle (8), you can see that the shared calendar has been added. At (9), you can see the color coding for appointments on the two different calendars being displayed. The shared mailbox appointments (10) are shown in green. Another method of opening a shared calendar is to click on Add Calendar menu then select From directory. Open calendar dialog box appears. Type the shared mailbox name. Select the shared mailbox name (5) from the search results then click Open (6). The shared mailbox shared calendar appears. To edit or update the shared calendar, create a new calendar appointment and it will be also visible to other people who have access to this shared calendar. To create a new appointment, select the date (8) when you want to create an appointment, a dialog box appears where you can enter the appointment details like the title, location, as well as the Start and End time then hit Enter in your keyboard to save it. The newly created appointment will appear for everyone who have access to this shared calendar. If you would like to view the shared calendar from an iPhone or Android device, please try our our free SaaS app to sync the shared folder directly to one mailbox, or every mailbox of every smartphone user.